The visual landscape of today's consumer is full of noise. A basic need for the survival and success of a new or existing brand is to leverage from differentiation. The challenge brands face is how can they differentiate in industries saturated with such noise, confusion and chaos? It is becoming more and more important for brands leverage from a standpoint, to stand for something within their space and own it. Become this point of view, or personality, and consistently reinvent in order to stay relevant. It is not surprising that Nike are the absolute masters of this. Their trademark ‘Just Do It’ was first launched in 1988 and has been consistently revisited and made culturally appropriate. With it's controversially received 30th anniversary 'Just Do It' campaign, Nike is once again declaring itself on a much bigger idea than simply within sport, it’s pulling at strings in the soul of the viewers, pulling at the idea of belief, to an almost cult-like tribal status. The importance for brands to pick sides, and stand for political and cultural views is more important than ever. Brands must continually take calculated risks, to create tribes, and keep market share. 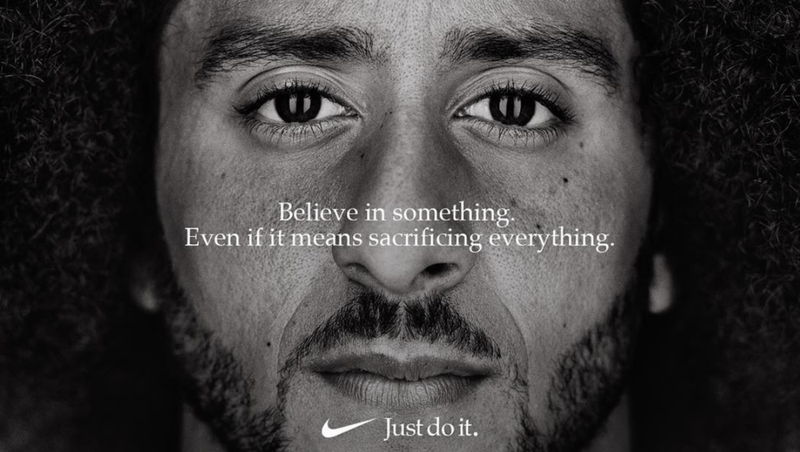 At the time of writing, one week after the launch of the 30th anniversary campaign of Just Do It, Nike's online sales had jumped 31%, compared to 17% the year before during the same period of time.